Brought to children in their early years by author Nansubuga Nagadya Isdahl of Uganda and from France, illustrator Sandra van Doorn, Sing to the Moon is easy to distinguish by its light touch, its fresh, quirky images depicting the world of children: balloons and stripy socks; ‘ forests with mythical beasts’ and slices of chocolate and vanilla cake. Are those cherries on top? 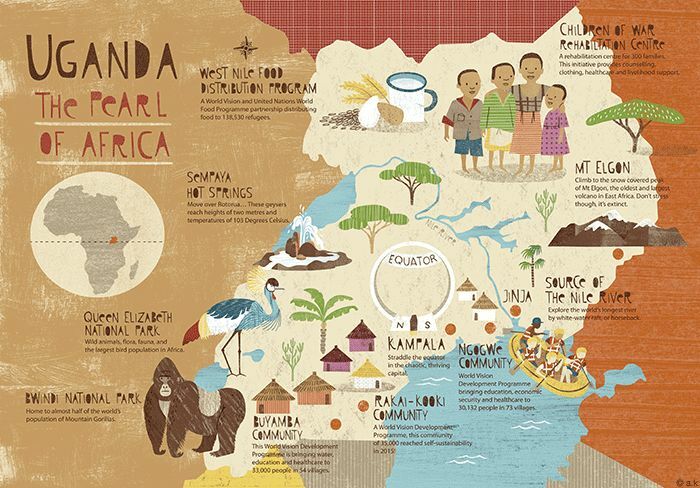 Universal childhood motifs are woven into a suite of delicate pictures presenting Ugandan people, easy Lugandan words, staple foods and customary dress. With their new Ugandan friend, children will travel on a dhow to an exotic land where they will find colourful spice markets to explore. They will visit him in his home where unfamiliar and delightful sights greet them: kerosene lamps, mounds of pineapples on top of the refrigerator, bunches of plantain stacked high, leaning against it. In the compound, an ankole cow is casually grazing. Can we stroke it? Uganda is also home to a vast variety of birds which pop up across the pages of this lovely picture book so that little ones can learn serious zoology from what is as much a celebration of filial love as it is a gentle presentation of diversity.